I couldn't resist taking the challenge. 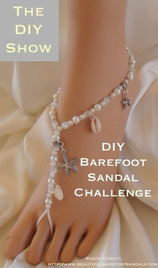 I have always wanted to do a barefoot sandal and have just never gotten around to is so I figured why not. 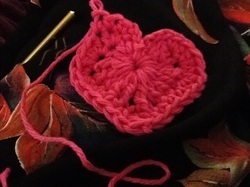 I realized I did not have any beads, shells or charms on hand, just yarn.....so one pair of crochet sandals coming up! I changed it up a bit and used an I hook and Caron Spa yarn in Rosalinda that I've had in my stash since forever. (sorry its discontinued but any 3 weight yarn would work). I worked the pattern up to row 3 when I diverted a bit. Chain 3, SC around to the bottom point of the heart, chain 10 and SC back into the heart point, SC around to the last stitch, ch 3 and ss into center. Finish off. Re-attach yarn in the 4th sc and leave a long tail for tying, repeat on the other side. Hope you go out and spread some love today!